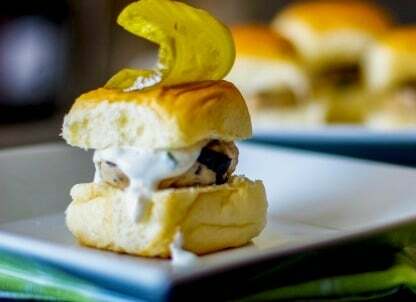 Mediterranean Turkey Sliders made with lean ground turkey, Kalamata olives, Feta cheese, and oregano on top of a sweet slider bun. Did everyone have a nice long weekend? We didn’t do much as hubby was still out of town staying with his mother and father, who is still in the hospital after having surgery last Monday. There were some complications, so his progress is going a little slower than anticipated, but he is expected to be coming home soon. Though many of you grill all year round, I tend to stick to my indoor grill during the winter months instead of venturing out into the freezing cold. 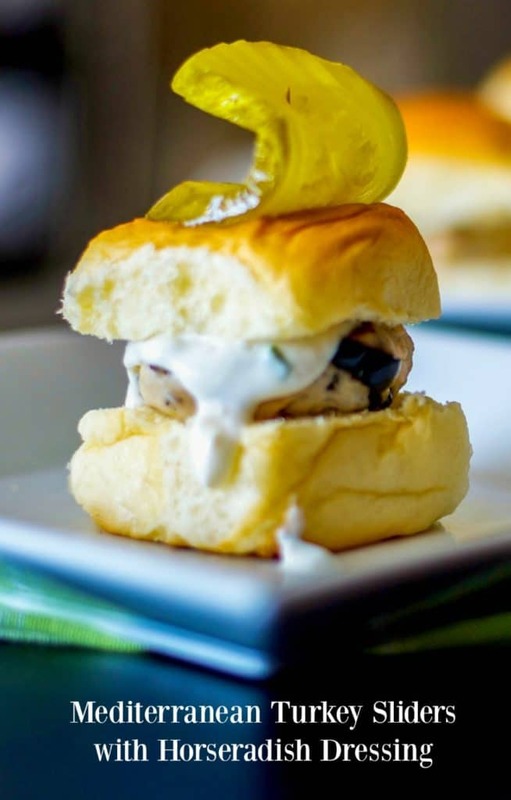 I had purchased some ground turkey a few weeks ago and wasn’t really in the mood for a meatloaf so I came up with these sliders. 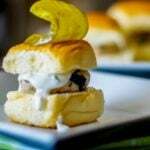 I REALLY liked these sliders and all of those fresh Mediterranean flavors like garlic, lemon, Feta and oregano really gave it a robust flavor; not to mention the little kick from the Horseradish Dressing and the sweetness from the Kings Hawaiian rolls. The family devoured these; even the little one who doesn’t particularly care for ground turkey. I personally think it was because they were so cute too! ~Enjoy! Combine the turkey, scallions, garlic, lemon zest, olives, cheese, oregano, and oil; mix well. Section the meat mixture into 12 equal portions and form small burgers with them. Grill approximately 3-5 minutes per side or until the meat is no longer pink on the inside. Place the burger on the roll; then top with 1 tsp. of Horseradish Dressing. Whisk all ingredients together until smooth. Keep refrigerated for up to 3 days. Makes 1/3 cup (16 teaspoons).